Certain bad or mediocre poets strike a chord with the sensibility of their day and they become popular. But the secret of that success, the hitting of a transitory sweet spot, also assures their disappearance when, inevitably, the public mood shifts. Who thinks of the saccharine-soused bromides of Rod McKuen anymore? "The People's Poet," as McKuen was dubbed in the late 1960s, is just plain obsolete, a fuzzy version of the Beat Generation's no-strings kind of guy. The English Catholic poet Francis Thompson's fall from favor at the middle of the last century is partly of this variety; that is, he could write a bad poem with the best of them and, similarly, his public's attention drifted elsewhere. But the particulars of his eclipse are also less nebulous; for he could write a good poem too: It was his being presented as a specifically Catholic poet that did for him. Thompson (1859-1907), that "shy volcano," as G. K. Chesterton called him, was best known as the author of "The Hound of Heaven," perhaps the most beloved and ubiquitously taught poem among American Catholics for over half a century. "I fled Him, down the nights and down the days;" it begins. "I fled Him, down the arches of the years; / I fled Him, down the labyrinthine ways / Of my own mind; and in the midst of tears / I hid from Him, and under running laughter." The wild poem rushes along, urgent and heartfelt, showing man careening through the world seeking love, meaning, himself, but finding everywhere everything "shattered in shard on shard"— until he hears Christ's message: "'Ah fondest, blindest, weakest, / I am He Whom thou seekest! / Thou dravest love from thee, who dravest Me.'" Thompson was born in Preston, Lancashire, a cradle Catholic and the son of a doctor. His first idea was to become a priest, but he dropped out of the seminary and was sent to train for a medical degree. He hated the field and, in time, having acquired an addiction to opium, left his college and disappeared into the London streets. There he lived a couple of years in destitution, before being rescued from suicide by a prostitute who cared for him until he was taken up by Wilfrid Meynell, the editor of a new Catholic magazine, "Merry England." Meynell and his wife, Alice, supported Thompson for the rest of his life—19 years. Freed from immediate want, he pursued a literary career, contributing poems, essays, and reviews to Meynell's magazine and elsewhere, and publishing three volumes of poetry. Despite his gratitude and deep feelings for the Meynells, Thompson was, it seems, something of a trial. With a short respite, he remained addicted to opium, and his melancholy nature was worsened by romantic troubles. He died at the age of 48. After Thompson's death, Meynell published collections of his works; and in the 1930s, Fr. Terence L. Connolly, librarian of Boston College, an admirer of Thompson and friend of the Meynells, brought the writer's papers to the University from England, establishing the Thompson Room to hold them. As curator of the collection, Fr. Connolly sought to promote Thompson's reputation, and he, too, compiled and edited volumes of the poetry and prose. (Indeed Connolly may have hastened Thompson's popular decline by cobbling together poems from Thompson's notes and drafts, producing works inferior to anything the author himself would have countenanced.) Although Thompson has fallen into obscurity, a new edition of his poems has recently been published by the library once led by Fr. Connolly, edited and annotated by Brigid M. Boardman, author of the 1988 biography, Between Heaven and Charing Cross: The Life of Francis Thompson. 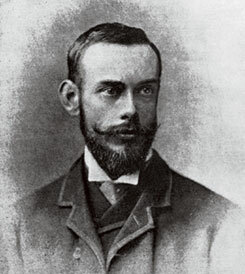 It may seem strange to us, and even a little annoying, that Francis Thompson—an Englishman, after all—was popular among U.S. Catholics in general, to say nothing of being celebrated at Boston College, whose collections today include such a wealth of Irish and Irish-American material. There's no getting around it: Englishness had, in that distant day, a caché that Irishness decidedly lacked; still, let us be clear what sort of an Englishman Thompson was. Like Chesterton, he was sympathetic to the Irish; and more to the point, his Catholicism, by virtue of his being English, was charged with meaning. The very existence of English Catholicism called attention to the fact that England herself had fallen away from the Church and conjured up Recusancy: courageous, defiant, and true. ("How sweeter than the bee-haunted dells / The bosomy blood of martyrs smells!" Thompson rejoiced in ghoulish surmise in "To the English Martyrs.") Whatever one's extraction, but probably most interesting to Irish-Americans, Francis Thompson was one of us, not one of them. Beyond giving rise to a certain tribal spirit, Thompson's poetry appealed to the American temper in its untrammeled, bursting quality, sometimes bumptious and garish, but fired-up nonetheless. It is filled, too, with archaisms, so dear to Americans of yesteryear, and with concocted words on the lines of "devinelier," "unprevisioned," "outlaw-wise," and "sighful." Over the fields of air. And washed in the stream of the sun. The melodies spurt and smart! Not everyone rejoiced in Thompson's linguistic abandon; his contemporary, the English poet Lionel Johnson wrote that Thompson "has done more to harm the English language than the worst American papers." It was the Meynells' avowed intent to promote Thompson as "the poet of Catholic orthodoxy," and to this end both Wilfrid Meynell and, later, Fr. Connolly excised from Thompson's poetry passages that smacked of Modernism, that capacious and ever-mutating bugaboo of the Church during the late 19th century and first decades of the 20th. They removed, for example, passages that sprang from Thompson's interest in ancient religions (or heathen mythology, depending on your view). Such deletions did not make Thompson more popular, just more palatable to wary orthodoxy. But by the mid-1950s this defensive, authoritarian impulse was identified by a vocal group within the Church as the reason for U.S. Catholics' cultural backwardness and lack of intellectual prestige. American Catholics were, as the leading critic, Monsignor John Tracy Ellis, put it, suffering from "a self-imposed ghetto mentality." Inevitably or not, such criticism became, in one short decade, orthodoxy itself; and American Catholics rejected the idea of a special culture. Catholic religion and Catholic culture separated. The former became seen, increasingly, as a private matter, as being merely one religious profession among the others practiced in the United States. The latter, tarred with the brush of anti-intellectualism, virtually disappeared. The poetry of Francis Thompson, though replete with learning and literary allusion—and the farthest thing from anti-intellectual—was a casualty of this temper nonetheless. According to biographer Brigid Boardman, Thompson believed he was writing for the future, that he was "the Poet of the Return to God." And, oddly enough—in retrospect— Monsignor Ellis, who inadvertently advanced the dismantling of Catholic culture, took a view of things entirely compatible with Thompson's, believing that "the moribund philosophy of materialism," which marked American society as a whole, was giving way to a society based in religious and moral values. It was this new order that would find leadership, he hoped, from a coming generation of Catholic intellectuals. Had that day miraculously dawned, an unbowdlerized Francis Thompson would have fit right in. As it happens, Brigid Boardman, who has restored the passages cut from his poems and included poems that "had been all but suppressed," believes that Thompson is more accessible now than in his day. His medical training and life on the streets gave him a gritty view of reality and a social conscience, and his governing idea that God is immanent in all things and in all experience, so vexatious to both Victorians and the Vatican alike, no longer strikes an alien or heretical note. Katherine A. Powers writes the column "A Reading Life" for the Boston Globe. Her reflections on the medieval imagination, "The Illustrated Life," appeared in the Winter 2001 issue of BCM. Photo: "I the body, He the cross"—Francis Thompson at age 34.